2018 will bring several comets close to the sun, a couple of them having enough brightness to be visible to the naked eye or to the binoculars. Obviously the data that we are showing below are estimated, as we know that comets are extremely volatile and it is difficult to exactly predict their behavior. One of the comets that will come close to the sun is an interesting Halley comet and it will really be worthwhile to get it both visually and photographically. In any case, all comets that you will be reading about could be within the reach of visual observers and astrophotography. The links of the positions that we report indicate the positions from the moment you look at them until the following 15 days, so you have to watch them during the times in which you want to observe the comets or in which we indicate that they will reach maximum visibility. 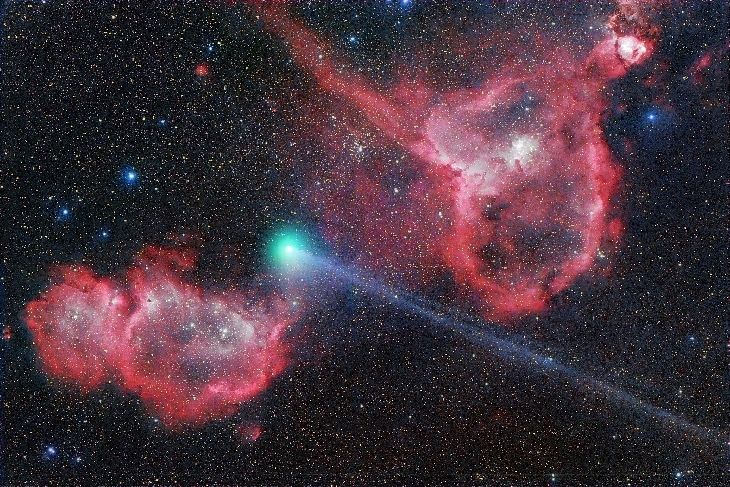 The first comet that we recommend is the 21P / Giacobini-Zinner, which will reach its maximum splendor this September. It is a comet with an orbital period of 6.5 years, which, during its passages, releases the detritus that then gives rise to the meteoric rain of the Draconids, visible in October. The passage of this year will therefore increase the range of debris and in the next two years this meteoric rain will be more conspicuous. This passage will be the sixteenth since its discovery and it will be a very interesting one that will bring the 21P / Giacobini-Zinner to just 0.39 Astronomical Units from Earth. It will begin to be barely visible now in June, and then more and more until September, the month when it will reach its peak of brightness. It could even be visible to the naked eye (obviously with very clean and clear skies) towards the end of August and remain lie this throughout September. Its path will be very interesting not only for its expected brightness, but also because it will pass prospectively close to some open clusters. On the 4th of July it will in fact pass 4 ° from the open cluster M39, but it will still be very weak to make the junction truly appreciable. On August 27th, the 21P / Giacobini-Zinner will move to just over one degree from the NGC 1502 cluster. Around September 13 we will see it near M37 and a few days later close to M35. September 26 will be a day you cannot miss: the 21P / Giacobini-Zinner will pass next to the beautiful nebula cone (NGC 2264) !! At the beginning of October it will touch the NGC 2301 cluster and a few days later M50 and NGC 2343. Finally, at the end of October it will pass NGC 2362. Another comet that could prove to be very interesting is the 29P / Schwassmann-Wachmann. It will be visible in September, in the constellation of Pisces. The 29P / Schwassmann-Wachmann has a very short orbit and returns to be seen almost once a year. This comet has a particularity that makes it very interesting: its core is very unstable. This means that during its passages at the sun the nucleus of the comet 29P / Schwassmann-Wachmann often breaks into pieces. According to astronomers, one reason for this could be that these explosions come from at least four active and independent areas of the nucleus. The activity of the active areas evolves over time and at each passage reserves new surprises. Another comet that could be seen in 2018 is the 46P / Wirtanen. This comet has a very chaotic orbit, and its distance to perihelion has been greatly reduced due to the approach to Jupiter in 1972 and 1984. This year it will reach perihelion in December, which will offer us a close pass at only 0.078 AU away from Earth. The 46P / Wirtanen could enter the field of vision already in August, although at that time it will be quite low on the southern sky. In November instead it will reappear to the north, and may already be visible with a simple 10 × 50 binoculars. From this moment on, the comet could become even brighter and find its climax in December, when it could even be visible to the naked eye! It is likely that its tail becomes very large due to its proximity to the earth, and probably the observation with the naked eye will be truly spectacular. All this could last until March 2019, a period in which it will begin to fade more and more as it returns to the deepest meanders of the Solar System. There will also be the 2017 Comet S3 (PanSTARRS) that should appear in July and become rapidly bright reaching the binocular visibility by the end of the month. It will be visible in the morning, and at the end of July it will pass near the open cluster NGC 2281. At the beginning of August it will be in conjunction with the Sun and we will not be able to observe it anymore. During its perihelion the comet 2017 S3 (PanSTARRS) will get so close to the Sun (0.2 AU) that it could also be destroyed! If this happens the event could be bright enough to be visible towards the end of August in the SOHO C3 coronograph. Another recommendation is the Halley comet 38P / Stephan-Oterma which was last observed in 1980/81 with a magnitude of 9. This year it will be visible starting in September and will increase in brightness until November. The other comets found in perihelion during 2018, such as the 48 P / Johnson, or the 185P / Petriew, the 365P / PANSTARRS, 2016 R2 (PanSTARRS) will hardly become brighter than the eleventh magnitude or will be visible in the northern hemisphere . Looking at 2020 we begin to anticipate the passage of the 289P / Blanpain comet that will pass to 0.089 UA from the Earth at the beginning of 2020. During this transition, it could reach without problems a brightness close to magnitude 5 and therefore visibly to the naked eye !